The Chinese Sturgeon Museum is situated on the islet in Xiaoxita, Yichang. 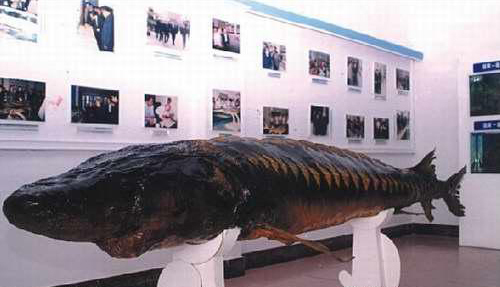 Built in 1982, the Chinese Sturgeon Museum is part of the Chinese Sturgeon Institution of China which is using artificial breeding techniques to try to preserve this endangered species. 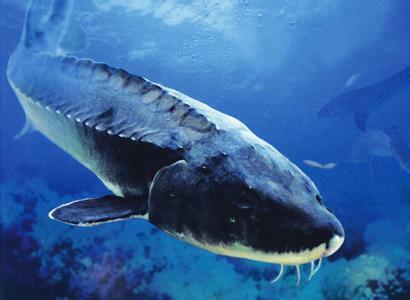 The Chinese Sturgeon is an animal strictly protected by the Chinese government. It has a history of 140 million years, and is thought to have lived at the same time as dinosaurs. That is why it is called a 'living fossil'. 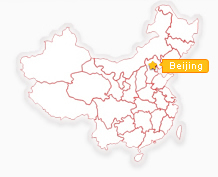 The Chinese sturgeon is mainly distributed in the trunk tributaries of the Yangtze River and some coastal rivers. Between the summer and autumn every year, it used to swim to the upper reaches of the Yangtze to spawn then carried its fry back to the lower reaches. It is large in size and imposing and dignified in bearing. The sturgeon can grow up to 4 meters (13ft) in length, weighs up to more than 1000 pound, ranking the biggest of all species of sturgeon in the world and the biggest animal in the Yangtze River. The dam of the Yangtze has blocked the sturgeon's route, which will have a bad influence on the natural breeding patterns of the Chinese sturgeon. The Chinese government is taking more measures to protect this kind of valuable and rare species. Chinese sturgeons are seasoned travelers, undertaking a round-trip journey of some 2,000 miles (3,500 kilometers) every year from the East China Sea to their spawning grounds in the Yangtze River. But in recent years this ancient cycle has been blocked by the Gezhouba Dam, built in the 1980s. Since that time subsequent dams have placed new, possibly insurmountable, hurdles in the sturgeons' upstream path and thrown the future of the species into serious doubt. Chinese sturgeons can grow to enormous proportions, with large specimens topping 16 feet (5 meters) and 1,000 pounds (450 kilograms). These prehistoric-looking giants have a sharklike form, with large pectoral fins, a rounded snout, and rows of pronounced ridges running the length of their spine and flanks.